Trollopiana Issue 93, Autumn 2012. Available to members only. Trollopiana Issue 94, Winter 2012/13. Available to members only. Trollopiana Issue 95, Summer 2013. Available to members only. Trollopiana Issue 96, Autumn 2013. Available to members only. Trollopiana Issue 97, Winter 2013/14. Available to members only. Trollopiana Issue 98, Summer 2014. Available to members only. Trollopiana Issue 99, Autumn 2014. Available to members only. 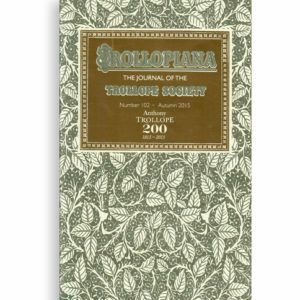 Trollopiana Issue 100, Winter 2014/15. Available to members only. Trollopiana Issue 101, Summer 2015. Available to members only. Trollopiana Issue 102, Autumn 2015. Available to members only. Trollopiana Issue 103, Winter 2015/16. Available to members only. Trollopiana Issue 104, Spring 2016. Available to members only. Trollopiana Issue 105, Autumn 2016. Available to members only. Trollopiana Issue 106, Winter 2016/17. Available to members only. 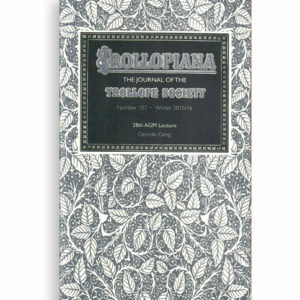 Trollopiana Issue 107, Summer 2017. Available to members only. Trollopiana Issue 108, Autumn 2017. Available to members only.